Goethe on Shakespeare / Goethe über Shakespeare. 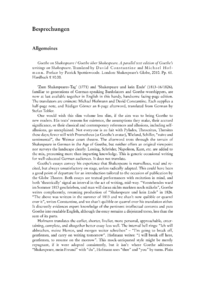 A parallel text edition of Goethes writings on Shakespeare. Zum Shakespeares-Tag (1771) and Shakespeare und kein Ende (181316/1826), familiar to generations of German-speaking Bardolators and Goethe-worshippers, are now at last available together in English in this handy, handsome facing-page edition. The translators are eminent: Michael Hofmann and David Constantine. Each supplies a half-page note, and Rüdiger Görner an 8-page afterword, translated from German by Stefan Tobler.